In this modern world, we are constantly in touch with (and cannot avoid) technology: Smartphones, tablets, computers, electric bed heaters, microwave ovens, remote controllers, wireless devices, etc.—all send electro-magnetic radiation into our bodies and cause silent inflammation that leads to various diseases and cancer. With the EMR exposure, the body builds up positive electrons that form free radicals. Coming into direct contact with the ground—barefeet on earth—acts as a negative grounding charge, canceling out the positive electrons. It is like discharging and resetting the body to its homeostasis state, being connected to earth’s frequencies. If you have a smart meter installed at your home, please read this article on how it may cause strange and unknown ailments in your household. How do you get grounded? How do you keep yourself a part of our natural planet in this ever-evolving, ever-digitizing world? Of course you eat healthily and drink fresh juices, but there is a growing practice that brings us back to Mother Earth. Along with walking barefoot, naturalists are also recommending hugging a tree. Trees are living things and have earthy energy on their own. 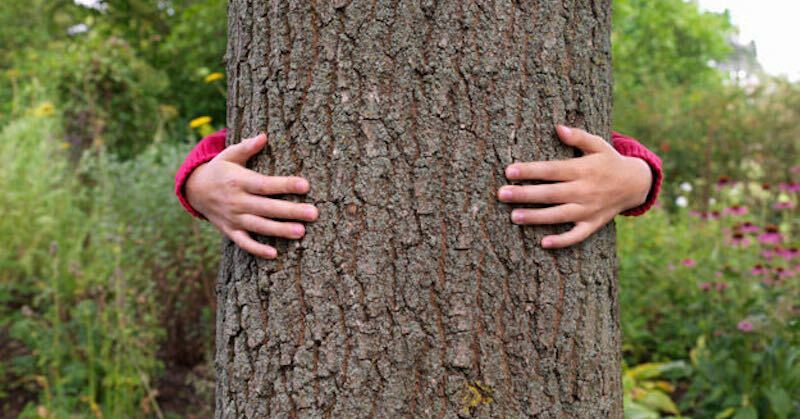 A recent book written by Matthew Silverstone, “Blinded by Science” confirms that hugging trees provides many healthful benefits that are backed by science. There is definitely some research to back up these claims. Check out these quiet health benefits of walking barefoot—go shoeless and hug a tree. Free electrons transfer from the Earth’s electrical field and into your body, which sounds a lot more difficult than it actually is. All you’ve got to do is take off your shoes and socks and go outside. Find grass or dirt to walk on, barefoot. You’ll want to spend at least 15 minutes a day grounded, but even if you only spend a few minutes earthing each day, you’ll get the benefits. Earthing is essential for our health. 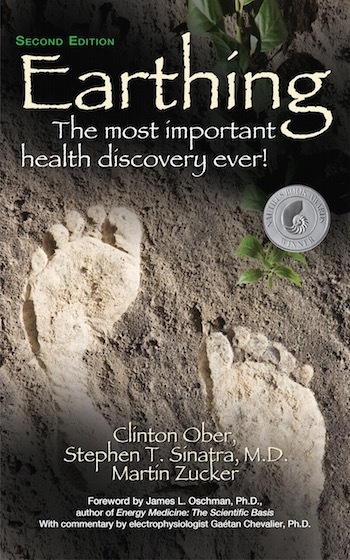 Earthing returns the optimal health and function of your body. Besides that, being barefoot is beyond beneficial for our bodies, brains, and being. Earthing enhances our connection to Mother Earth. We come from this planet, we eat from the earth, and we share minerals and nutrients with the earth. Going barefoot will remind your body of this. Earthing recalibrates our senses, giving our core being some much needed environmental information and a heightened sense of awareness. Being barefoot in Nature makes you feel wild and free, thus reducing stress level and balancing our busy modern lives that are peppered with technology, electricity, and free radicals like pollution and disease. Our constant contact with electronic devices/gadgets like computers, tablets, smart phones, etc. expose our body to electromagnetic fields that can be detrimental to our health. When you walk barefoot on earth, your sole’s contact with earth soaks up millions of electrons into your body that detoxifies. It has an alkalizing effect on your body that “thins blood” and helps reduce blood viscosity that is a common cause of insomnia, fatigue, blood clots, stroke, heart attack, diabetes and other diseases. Take it like discharging/detoxifying the electromagnetic fields (EMF) from your body, if you would. Walking with wet barefoot is best for conductivity discharge. The electrons you receive from earthing neutralizes free radicals that damage the healthy cells in your body. These free radicals cause everything from advanced aging to cancer. Eating foods high in antioxidants and earthing are the best ways to defend against free radicals. Many proponents of grounding believe that it can help fight inflammation. The idea is that the negative grounding charge will help defuse positive electrons that may be responsible for increasing inflammation. Without earthing, inflammation increases. Humans are affected by so many inflammatory diseases that we treat, but we are merely treating symptoms. Earthing is a quick, easy, and zero-cost way to reduce inflammation to avoid sickness. A reduction in inflammation will in turn reduce your chronic pain. While this may not be enough to completely cure your chronic pain, it could offer a level of relief. This bit of relief may even be enough to help you cut back on pain medications or other treatments for your chronic pain. One of the things that fascinates me most about tests done on earthing/grounding, is thermographic imaging that shows the heat map of the body. 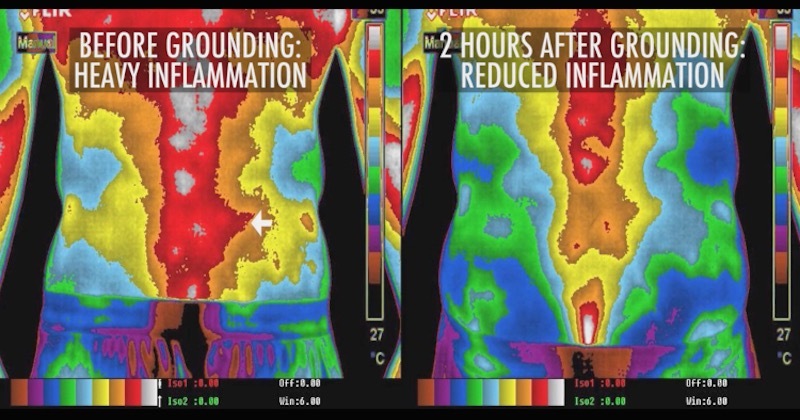 Bright, yellow-orange-red colors on the thermograph shows inflammation in the body. 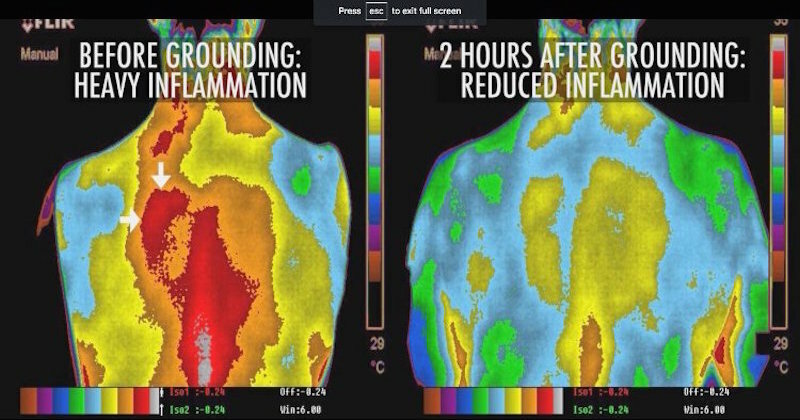 In the two graphs above, you can see an overall reduction of inflammation in the body, after this patient did a 2-hour grounding. This is one of the health benefits of walking barefoot, that is most widely reported by people who practice grounding. By freeing your body of harmful electrons, you may feel revitalized and discover a boost to your normal energy levels. Have you ever stood next to a waterfall or gone swimming in a lake and felt naturally energized? This is thanks to the free electrons in these settings. You can get the same body-grounding effects just by walking barefoot in the grass daily, especially with the morning dew. Earthing can even re-energize you during a midday grog. It’s a better and more natural way than stimulating drinks such as coffee, that can tax your adrenal glands and give you a crash. Each foot has over 7000 nerve endings. The ancient practice of reflexology states that these points connect to our organs and different bodily systems. Earthing stimulates reflexology points that are overlooked as they sit in shoes and socks all day. Walking barefoot on uneven surfaces like the Earth puts pressure on passed-over points in your feet, which improves your overall health. The most promising research into grounding found that sitting in a comfortable chair with your bare feet firmly on the ground can help to boost your mood. In a study involving 40 participants, researchers split the participants into two groups. One group relaxed indoors while the other group relaxed outdoors without any shoes on. The majority of the group that relaxed outdoors experienced improved mood and relaxation at a higher rate than the group that simply relaxed indoors. With tree hugging, it was found that it specifically benefited individuals who are depressed, have ADHD, headaches, stress. Children who hug trees are said to function better cognitively and emotionally. Some people claim that grounding has helped them deal with muscle tension and headaches. This benefit could be the result of the increased relaxation and the potential for lowering your blood pressure. This combination of effects may be enough to help relieve a headache or ease simple aches and pains. Since grounding is supposed to help you relax, it is thought that this technique may also help to lower blood pressure levels and improve blood flow. Lowering your blood pressure and improving blood circulation could potentially reduce your risk of heart disease and stroke. 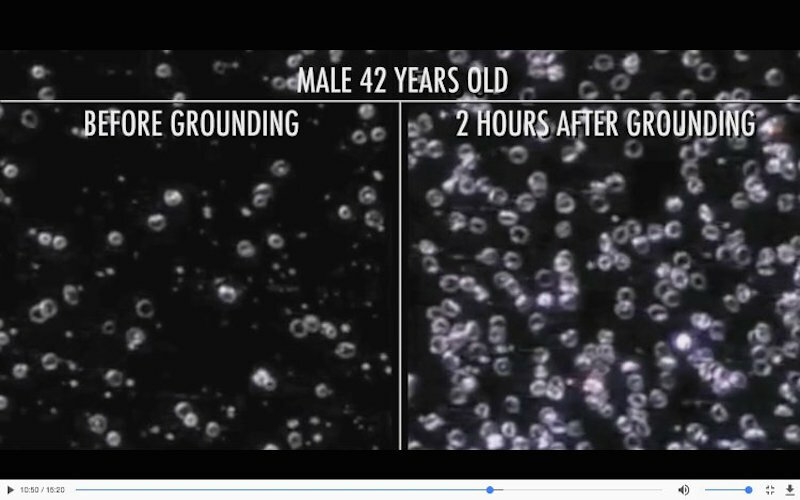 This blood cell analysis shows the improved blood velocity after two hours of grounding … woww! Sleep is an essential part of your health. By relieving stress, improving energy, lowering blood pressure, and relieving headaches, you may end up experiencing improved sleep patterns. Many grounding enthusiasts have mentioned that grounding on a regular basis has helped them get a better night’s rest. Walking barefoot helps realign your spine. Raised heels and extra cushioning in shoes distort our posture, not to mention a sedentary lifestyle in a chair and in front of a screen. Exercising barefoot improves posture very quickly, so earthing is an easy, low-stress way to improve your form. Better posture eliminates aches and pains that keep you up at night. Allowing your feet and ankles to walk without shoes lets them move unrestricted and in a more natural way. Shoes bind our feet and lower leg muscles, making them atrophy. Earthing activates your feet and ankles and stimulates a connection between the feet and the brain, which increases overall strength, balance, and awareness. Perhaps, the most profound miracle of grounding can be witnessed from this documentary. Dave Olerud who had been in a wheelchair for almost 30 years, began earthing for two weeks. After that two weeks of earting, Olerud was able to get up from his wheelchair and slowly started walking again! This documentary is lengthy but educational. Meet paraplegic Dave Olerud at 22m:30s and his small victory at 1h:06m:30s. For effective grounding/earthing, your skin must be in direct contact with the grass, soil, stones, or water. Having wet feet or walking on wet ground seems to yield better results than dry contact. The beach is possibly one of the best places for grounding. Salt water has very high content of minerals which is perhaps why beach vacationers tend to sleep better after walking on the beach! If you are living in the city, walking on cement and tarred road doesn’t work as well as walking on natural soil ground. In fact, on some grounds it may be harmful due to ground current. Ground current may pose problems from wires running underground. In a place where you have little access to Nature, you may use earthing mats or earthing sheet. This earthing mat can be placed on the floor under your bare feet while working on a computer, to reduce the amount of EMFs that you are exposed to. I like this earthing sheet that can be used to be spread on your bed, or on the floor. For best effect, allow maximum skin contact with the sheet. The size of this sheet makes it a dual-purpose—for your floor exercise/yoga and earthing at the same time. Test Out The Benefits For Yourself! The results of studies on grounding/earthing have been positive and there are many first-hand accounts of the benefits of walking barefoot. Hopefully, this means that researchers will begin to look further into the advantages of grounding and uncover or verify additional medicinal benefits. For now, you can test out the benefits for yourself. Take off your shoes every evening and spend a few minutes with your feet planted firmly on dirt, or hug a tree.